State of the art emergency animal hospital. Opened in 2015 by Prime Minister Tony Abbott. Northside Emergency Vet Services is a state-of-the-art animal hospital, purpose-built and equipped for a wide range of pet emergencies. Based in Terrey Hills and serving Sydney’s North Shore, Northern suburbs and Northern Beaches, we offer an extension of the services offered by your family vet, providing after-hours emergency care 365 days of the year. As in human hospitals, we work on a triage basis, prioritising veterinary access by urgency. On your arrival, one of our experienced vet nurses will assess the level of medical emergency. Feel free to virtually visit our animal hospital via Google Business View and get a 360-degree panoramic tour of our emergency animal hospital. From the image of reception, use your mouse to navigate and walk through from room to room visiting the theatre, wards, consulting rooms and ICU. Click here for a full-screen version of our animal hospital. Opened in 2015, our purpose-built 24 hour vet Hospital provides a wide range of emergency vet services, including extensive rooms and equipment to best cater for your pet’s needs. 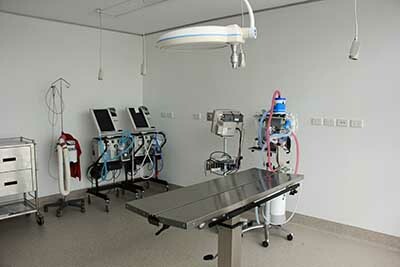 The hospital includes a human medical grade surgery, 3 consulting rooms, separate dog and cat wards, a designated intensive care unit (ICU) and a comfortable, spacious waiting room. Our services are supported by a wide range of vet equipment, including a state of the art digital X-ray unit (with an imaging suite that allows immediate diagnostic analysis), ultrasound, endoscopy, ECG, blood transfusion machines, ventilators and on-site pathology. Vets have access to an on-site well-stocked animal pharmacy, which includes specialist pharmaceuticals to treat life-threatening conditions including a range of snake antivenins. We also run a canine blood bank for emergency blood transfusions. One of the most commonly treated emergencies in our animal hospital is potentially lethal tick paralysis. Treating many thousands of emergencies every year, NEVS is known for its world’s best practice tick paralysis treatment. With its decades of experience, NEVS is responsible for significant advancements in the treatment of tick paralysis, especially in the area of ventilation. For more information about our animal hospital, or to make an appointment for your pet, call the clinic on (02) 9452 2933 or contact us online.